Karachi, National Snooker Team arrived at Karachi Airport after winning the world class title of World Snooker Championship. This championship was played in Ireland and Pakistan beat Iran in the final after tough fight with margin of 5-3. 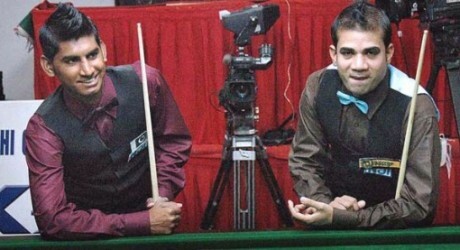 Pakistan two top players of Snooker participated in the championship and won the title. Pakistan national snooker team including Muhammad Asif and Muhammad Sajjad played the championship. They said on the airport that they got the success with the blessings of Allah and prayers of the countrymen. They also shared that they fought for the world class title in the final, which was very tough but they won the title by adopting good strategy and managed the final with great triumph. The president of the Pakistan Snooker Federation, Alamgir Sheikh said that he and all their federation is pleased with the great success of their team. They were expected that any government official would come to the airport to welcome their players and paid tributes to them on their great triumph but no one came here to greet their players on the success of world class title. He also said that their previous funds for matches being played at Qatar, China and other countries are not still paid to them. He hoped that government will interfere and solve the problems. He also expected that government will take concrete steps to solve the problems of Pakistan Snooker Federation and played role for their resolution.